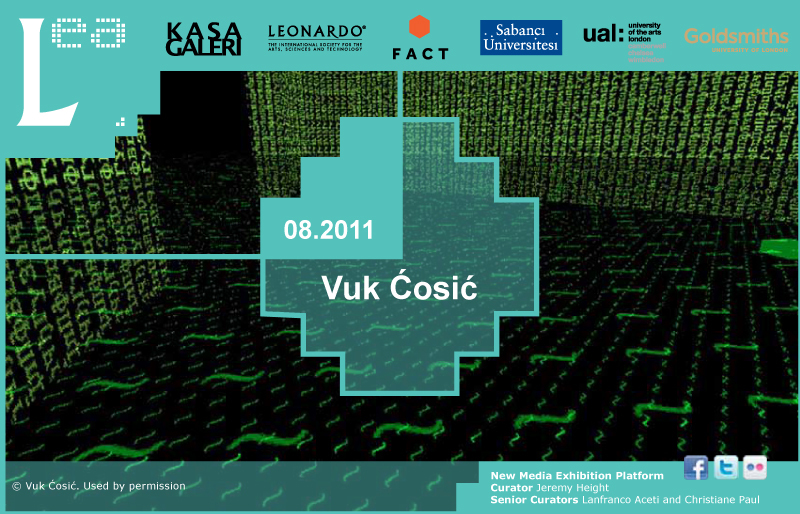 Vuk Ćosić co-founded of Ljudmila –a digital media lab for artists in Slovenia and of the ASCII Art Ensemble, Nettime, Syndicate, 7-11, and Ljubljana Digital Media Lab. Pioneer in net art and new media art as well as hacktivism. Well known for running ASCII (American Standard Code for Information Interchange) variants of iconic film scenes thus transforming code, image and pixel into a collision and immediate commentary. Exhibitions include Venice Biennial; MIT Medialab and many other museums and festivals internationally.